Does your child use a sippy cup? When your child graduates to a sippy cup, it can be a delight. 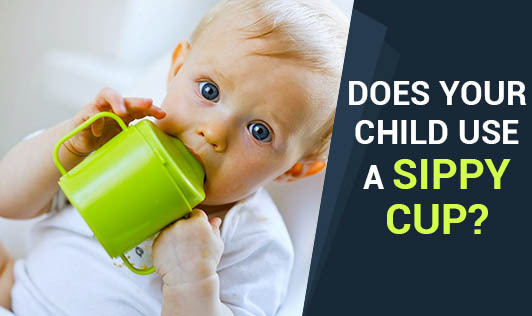 The child feels like a big kid by using a cup, and you'll avoid any issues with spilling. But sippy cups have its downfalls too. Using them correctly helps avoid the possible pitfalls of this common tool. Time Frame: While each child develops at his own pace, most children are ready to start using a sippy cup by their first birthday. Warning: Sippy cups have been linked to tooth decay in early childhood. This results in children given a spill-proof sippy cup and keeping it with them for hours at a time. When the liquid is ingested over a period of time, it can cause tooth decay, unless the liquid is water. Effects: Child development specialists have noted that overuse of sippy cups might cause a delay in speech development. In particular, speech pathologists suggest that overuse of the sippy cup leads to a lazy tongue. The position of the mouth when using a sippy cup leads to an open bite. In turn, this can lead to tongue thrust, which can impact the way a child speaks. Speech pathologists suggest limiting sippy cups to meal times and snack times, but not allowing a child to walk around with a sippy cup, to minimize any potential for speech delays. Prevention: While sippy cups help parents, do not overuse them. They are a tool to help your child transition from nursing to more independence. Once your child has mastered the art of putting the cup down without spilling, discontinue the sippy cup.